Technology has really revolutionized Volunteer SignUp Forms. Gone are the days when volunteers signed numerous clipboards, or filled out lengthy volunteer surveys, only to find they’d double-scheduled themselves as both library volunteer and lunch supervisor. SignUp.com has taken the headache out of scheduling with free volunteer interest SignUps that allow organizers to compile volunteer information quickly online, in one place, with free easy reporting features and 24/7 accessibility! 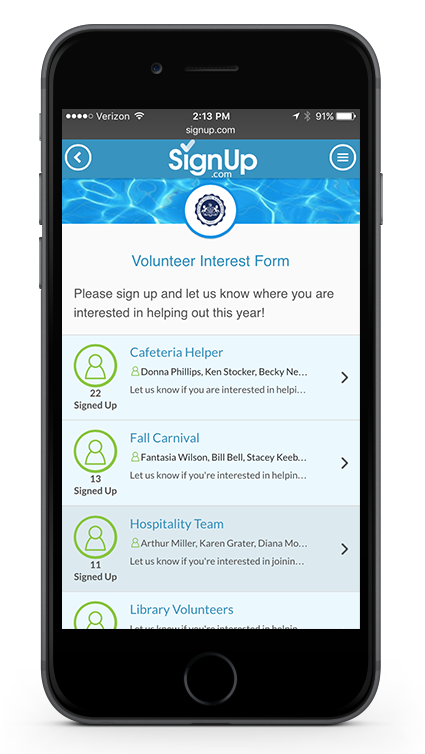 Volunteers can view their interest sheet at any time from any device - with a few clicks and taps, they've shared their contact information and where they want to pitch in. Create a new SignUp and choose "No Specific Date" as the SignUp type. Add a Spot for each volunteer job or committee, and specify how many people can sign up (typicality set to "Unlimited"). i.e. Hospitality Team, Registration Team, Fundraising Team, Appreciation Events, Health & Safety, Day of Service etc. 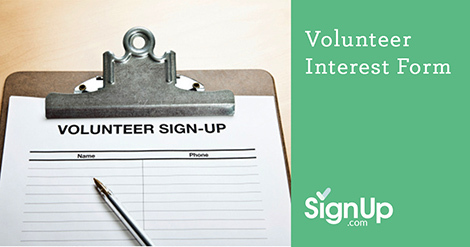 Post links to your Volunteer Interest Form in your eNewsletter or on social media and invite volunteers to sign up. Participants receive automated reminders, eCalendar syncing in real time, and can access the SignUp sheets from their mobile devices --all FREE of charge!